Since last week I have a new digital SLR camera: a 15 megapixel Canon EOS 50D. With it I took my first photo set with Photosynth in mind. I am very happy with the result: 98 photos that are 100% synthy (meaning that they all connect into one seamless 3D scene). Of course, this synth is best experienced live because then it is fully navigable. You can move around using the mouse, cursor keys or keyboard shortcuts. Also try to zoom in. Fifteen megapixel pictures give you quite some leeway for zooming into details. Have you created a nice synth? Leave the link as a comment so that I can check it out. Posted in Personal, Photography, Photosynth on October 5, 2008 by Erwyn. For the last week, I have been in love with Photosynth. It was a tech preview in view-only mode for quite a while, but now we finally released it to the masses. 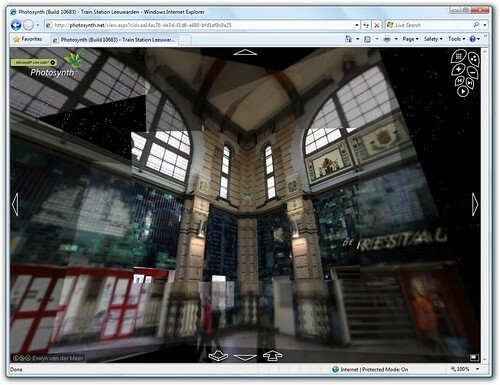 Photosynth is a prime example of the execution on our Software + Services vision. It combines the best of the web with local computing power (on Windows). PS: I have a 40 Megapixel picture of Mount Rainier stitched from the same pictures as above. For the stitching I used Windows Live Photo Gallery. You can view it using Silverlight DeepZoom technology. 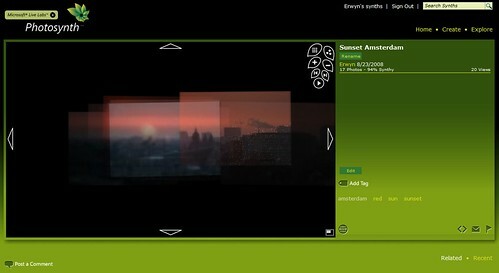 Posted in Personal, Photography, Photosynth, Silverlight, Software+Services on August 27, 2008 by Erwyn. Yesterday evening I found that McDonald's is discriminating against the car-impaired. I am currently in Seattle for the Microsoft TechReady conference. After a photo walk with two colleagues we were getting thirsty and hungry. I managed to stay out of McDonald's for the almost four weeks that I have been in the States, but the McDonald's two blocks away from the Space Needle was a bit hard to resist. We arrived there at 23:02 and the "restaurant" had just closed. However, the drive thru (yes, that seems to be the correct spelling here) is open 24 hours per day. But what do you do when you don't have a car? You walk through the drive thru. We weren't carrying enough metal to trip the detector in front of the ordering pole. So we couldn't state our order. We preceded to the pay window to order there. The guy there looked very amazed and said he could not and would not serve us. WTF! "Why not?" we asked. "Because you don't have a car", he replied. Disappointed we left. Next time, I will try riding a bike through the drive tru. In the mean time I will boycot McDonald's for a while. PS: This is just for my own good as I have the feeling that I gained a couple of kilos here in the US. Posted in Personal on July 31, 2008 by Erwyn. It depends on the situation if I self-identify as a geek or not. Today, I thought it would be fine, so I signed up for the Geek Dinner organized by Scott Hanselman in Bellevue, WA. Quite a lot of people showed up. I went there with my colleague Erwin van der Valk. He was a Development Consultant, like I currently am, at Microsoft Services in the Netherlands. Erwin now works on the Patterns & Practices team at Microsoft in Redmond. Too bad, I won't be able to attend this event in the near future again, unless I just happen to be in the neighborhood. 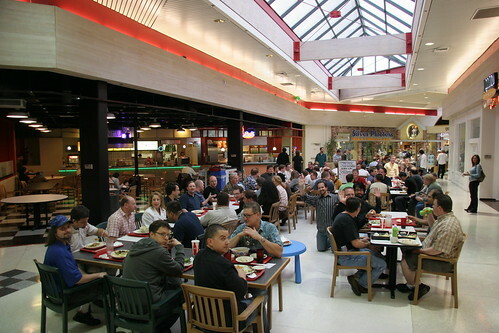 Posted in .NET, Geek Dinner, Microsoft, Personal, Work on July 22, 2008 by Erwyn. Best wishes to everyone for 2008! 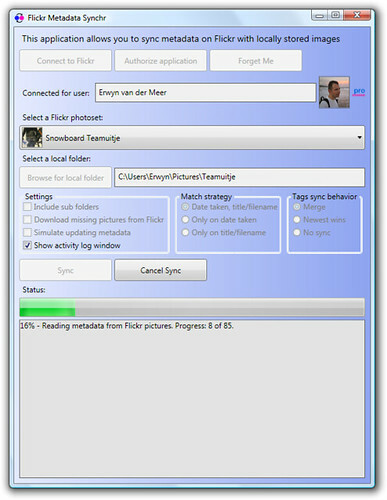 In the first day of the new year, I've released version 0.9.0.0 of my Flickr Meta Synchr tool. You can always find the latest version on CodePlex. Added much better activity logging. The activity log can now be shown in an additional window and is persisted to disk. Added the option to match pictures on title and filename. This is useful when images have been timeshifted and cannot be matched on date taken. Bug fixes. Improved stability when corrupt image files are encountered. Fixed GPS roundtripping bug. Should run better on 64-bit versions of Windows XP and Vista. Solution is now built in Visual Studio 2008 without the need for any additional WPF extensions. Posted in .NET, Personal, WPF on January 2, 2008 by Erwyn.